If you are a pet owner and if you say you have never been struck by the fear of your pet gone missing, you know you would be lying. We all love our little buddies too much to not care about them to go missing. Pets are always curious and it can lead them to places where they may get lost. A dog tag comes extremely handy in situations like these. A custom dog tag can have the name of your dog inscribed on it with the address and any other important detail along with the emergency contact number in case they are lost. The address and number will help the person, whoever finds your pet, to inform you. The name inscribed on the pet ID tag will give the person who finds your pet a name, they can use this info to establish a first-person connect with your pet by making it feel less insecure. And in case of the contact number being unavailable, the finder can reach you at the address given on your pet ID tag. In this article, we will see how these custom dog tags for pets are useful in keeping your loved animals close to you and ensuring their safety. These tags also look ravishing on certain dogs, we will learn about that too. The major reason to get a pet ID tag is that they will ensure your dog’s safety. The ID can have the name of your dog, the address and your contact if you are willing (some people may not be comfortable giving their phone numbers away). If your dog ever gets lost, it is for sure that someone will find it somewhere and then use the dog tag to reach out to you and deliver your dog back to your hands. A dog without a custom tag has far lesser chances to be found back. Either they need to be professionally trained to be able to trace back home or should be smart enough breed to find their way back on their own. In a lot of cases, this might not always be possible, so a custom dog tag seems to be an excellent precaution. The custom ID on your pet’s tag can also mention a certain disease that the pet must be carrying or if the dog has temperament issues. This will protect other people from making any wrong advancements towards the pet. If someone finds your pet and is willing to take the pet back to you. They must know the risk it may carry if any. This will ensure their safety as well. Now you don’t want to let a dangerous pet out and then be at risk of getting sued. To avoid this situation, make sure you least 1 important fact about your pet. If you get a nice dog tag for your pet, it may also go very well with your pet’s personality and can be enormously appreciated by other people who like your pet. It is never a bad idea to make your pet dog or cat look even more handsome than they are while ensuring their safety. 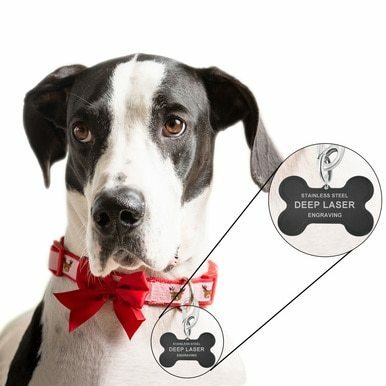 One should get a custom pet ID tag made at Divoti, they have a whole wide range of Dog tags that may suit your pet’s personality amazingly. Their high tech engraving techniques are resistant to getting rubbed off. Check out the custom options available in numerous shapes and sizes.